There have been many great big bands in American history, but few played with the power and harmonies of Stan Kenton, nor swung like Buddy Rich. Sarasota Jazz Project will close out its season in April with a salute to these two great bands. We will be doing the classics, the swing years and the ultra-cool. And, we plan to close out the season with Buddy Rich’s amazing “West Side Story Suite,” with our own showcase drummer. 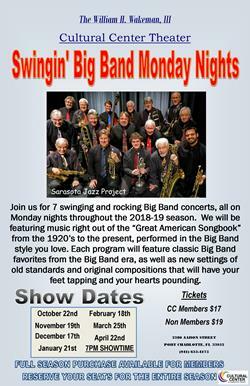 Chuck Parr, virtuoso pianist, Jerrry Eckert, toe-tapping bassist, Todd Jefferis, and the many swinging jazz soloists of Sarasota Jazz Project Big Band. 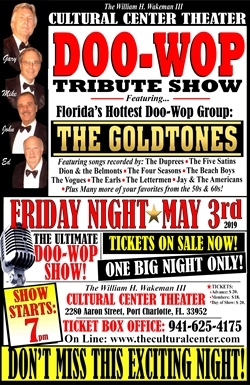 The William H. Wakeman III Cultural Center welcomes the return of Florida's Hottest Doo-Wop group, The Goldtones. Known for their exceptional street corner harmony, The Goldtones will perform all your favorite oldies from the 50s & 60s. The Goldtones are Florida's most requested Oldies group. 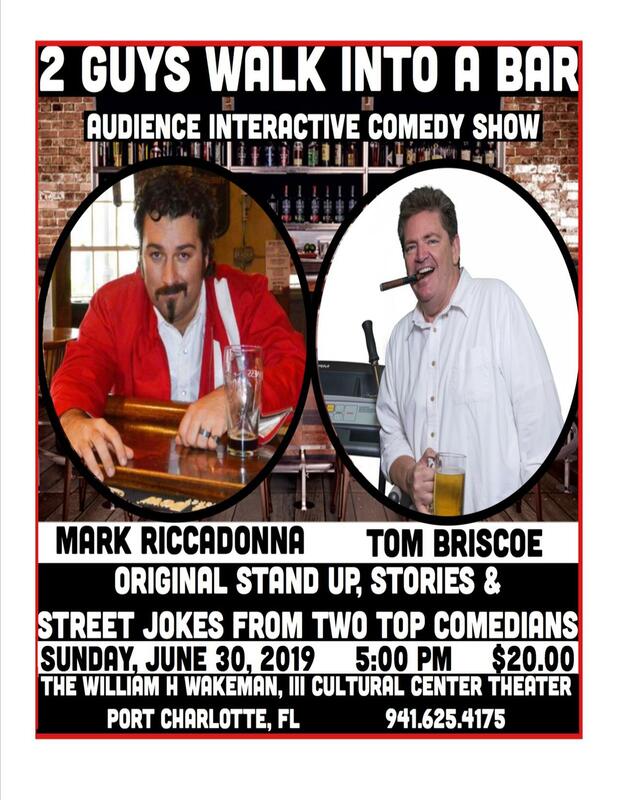 This show will entertain you with Origingal Standup, Stories and Street Jokes from two top comedians, Mark Riccadonna and Tom Briscoe. After the audience picks a topic, these two top comedians tap into their reserve of original stand up material, stories and classic jokes to ensure that no two shows are alike. The stage gets transformed into their favorite bar, complete with a bartender. They also leave room for special guests and sometimes even a house band. It makes for a hilarious, unique, comedy show every time. Audiences are blown away by their quick wit, timing, rapport and repertoire drawn from decades of comedy, show business and friendship. Since they are at different stages in life, the show hits the funny bone for adults of all ages. Tom and his wife are happily married with two daughters, grown up and out of the house. Mark and his wife are happily married with two little boys, who are destroying the house. The biggest common denominator for these best friends in the business is they both always bring the funny. Varies based on the show, please see show details at left for ticket pricing. Fees: $2 processing fee included in ticket price. Can't print at home? Contact the box office to print your tickets!